License Buying Facilitation® for corporate training & training companies. More. Dirty Little Secrets. Sample Chapters. For corporations: Sales professionals learn to teach buyers to navigate through their internal buy-in. More. Have Sharon Drew speak at your next sales conference. More. 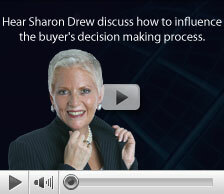 Sharon Drew discusses buyer's decision making. Watch and Listen.